Dr. Tony Alamo, ’86 BA Chemistry, was recently named the College of Sciences Alumnus of the Year. Alamo is the medical director of the Alamo Medical Clinic, specializing in internal medicine and currently serves as the chair of the Nevada Gaming Commission. After completing his bachelor’s, he left UNLV to attend the University of Southern California School of Medicine. He returned to the Las Vegas valley to practice medicine and served as Chief of Staff of two hospitals: Sunrise Hospital and Children’s Medical Center (2002-04) and St. Rose Dominican Hospital’s San Martin campus (2006-09). 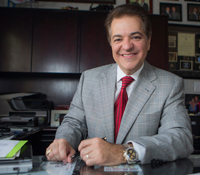 During his seven-year tenure on the Nevada State Athletic Commission, Dr. Alamo served as its chair and had the privilege of sanctioning the largest bout in boxing history – Oscar De La Hoya versus Floyd Mayweather in May 2007. He addressed many other interesting and difficult decisions, the most notable being the denial of licensure of Mike Tyson in January 2002. During this time, he also coauthored a paper in the Journal of Neurotrauma regarding traumatic brain injury in unarmed combatants. He was instrumental in mandating hepatitis testing for all athletes. In 2006, he was the first civilian to be awarded the “Medal of Valor” for “Valorous Conduct” in a hostage barricade situation from the Las Vegas Metropolitan Police Department. I was born in Reno and came to Las Vegas in 1974 at the age of 10 when my father transferred to a new job at the Circus Circus. I attended 5th grade at George E. Harris Elementary School, went to Woodbury Middle School, and graduated from Chaparral High School in 1982. Out of high school I was very studious with exceptional grades and a good ACT score. I was accepted to both USC and UCLA and decided to go to UCLA for my undergraduate education. Not liking the large classroom size and minimal professor-student interactions (my chemistry class had nearly 200 people in it) I began to search for another institution that would offer me an excellent science-based education and also give me the greatest chance to go to medical school. I looked to my home school, UNLV, and spoke with Lon Spight, who was the chair of the Department of Physics at the time. He gave me a personal tour of the College of Science, Math, and Engineering (at the time it was all combined). I was amazed to find that the engineering physics, inorganic and organic chemistry, and calculus courses were all using the same books being used at UCLA. I had a heavy credit load of science classes for my chemistry major during my first semester at UNLV and I found myself very challenged. The professors were excellent and gave us personal attention. After that semester I realized that the school in my hometown was a lot better than what I had thought and in this chemistry department I could get an excellent science education and become very competitive during the medical school application process. I thought a more difficult major such as chemistry would set me apart from other medical school applicants. I believe that chemistry was technically harder to excel in and I still believe that today. What was UNLV like when you were here? I was here from 1982-86 and the campus was less than one-half the size it is today. There was very minimal campus life, with only one dorm, the original Tonopah Hall. It only had one sport that it was known for: UNLV Runnin’ Rebels basketball. Today’s UNLV can compete with any university in the country. I believe academically as well as athletically it has the campus life, the academics, and the feel of a big time campus. When did you know you wanted to be a doctor? My father introduced me to a friend of his who was an emergency room physician-pilot. I met him during my high school years and he took me under his wing, letting me fly in his plane in the cockpit while he traveled to rural Nevada and Arizona to treat patients at clinics. That was the beginning of my impetus to have a career in medicine and also my love of flying. At the age of 19, I received my private pilot license and since then have become a multiengine commercial instrument pilot, owning and operating four different aircrafts. Has your profession been what you expected? The profession of medicine has drastically changed on the fiscal side; however, the patient-doctor interaction has not. There is nothing more covenant than the privilege of walking into an exam room and being able to help someone at their darkest, most vulnerable hour. That truly is a privilege, and that part of medicine has not changed. Consider your undergraduate education as a beginning and not an end. Before I think people could achieve their goals through a baccalaureate, but I suggest using that as a foundation to go to the next level. Look at graduate programs, law school, dental school, medical school, or accounting, you need to take it to the next level using the baccalaureate as the foundation. I have been an avid aviator since the age of 19 and have flown many different types of aircraft and currently hold a commercial multiengine instrument pilot rating. I have owned four different aircrafts, and currently fly a Meridian, which is a single engine pressurized turboprop jet that can travel in excess or 300 mph at 30,000 feet. It gives you a different life experience to see earth at that altitude and speed.